Photographs of the best hiking trails in Oklahoma found here and in this book. 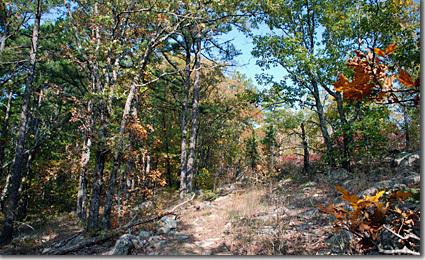 Ouachita Trail displays brilliant fall colors here. Color photos of Charons Garden in the Wichita Mountains, Greenleaf Lake, the Ouachita Trail, Black Mesa and McGee Creek and more are available. 76 color photo are in Oklahoma Hiking Trails guidebook. Yours with author autographs for only $19.95! Oklahoma’s varied hiking terrain provides a photographic feast for outdoor adventurers, and Oklahoma Hiking Trails provides 76 color photos for a visual tour of the state’s best hiking venues.